On Thursday after my class, Mamarazzi said wanna bring me go "swimming" but have to called up the Jie Jie ask got "room" or not. The Jie Jie confirmed said Sunday got room and I can go "swimming". Then Friday night Papa "ajak" me go picnic on Saturday morning. I said I wanna go picnic at Pantai(beach). I was very excited. Dug out all my "equipments". Can't seems to go to sleep. Kept reminding Mamarazzi to set alarm. The next morning, Mamarazzi woke up 6.30am to pack some drinks and same clothes for the picnic. I got up very fast too when Mamarazzi woke me. Took my bath and everything. After Papa took bath, he said to pack up some clothes coz going to Malacca straight after the picnic. Finally arrived at Port Dickson! Now where to "swim" ? Round here round there ...it's either the beach was gone or water too dirty. Finally settled at Blue Lagoon. The water still acceptable and there is still beach here. 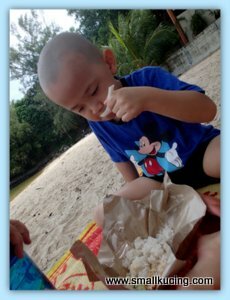 I went to play Sand Castle with Papa while Mamarazzi had her Nasi Lemak under the shade. Can you guess what I've dug up ? It's in my blue bucket. Yup! It's Lala. Errrrr.....not sure what it's call in English....is it Clam? Anyway, there are still alive! Just like the one in "Rupert's Undersea Adventure" book. It can open and close. Nope...it's a naughty kucing who tries to splash sand at Mamarazzi. Very soon I started to sneeze. Then Papa said makan first before play some more. Get warmed first. 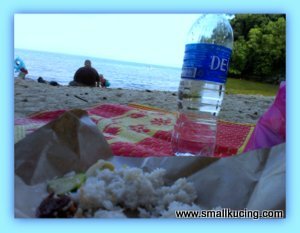 Mmm....nice nice Nadi Lemak which I did not enjoyed coz too worried that the Sea would go away. Anxious to play some more. I have never been to PD yet, water kucing looks like having a blast! after school holiday still go for cuti cuti malaysia.. I have not been to PD quite sometime.. The last time I was there more than 15 years ago. small kucing so brave go and swim outside the sea? 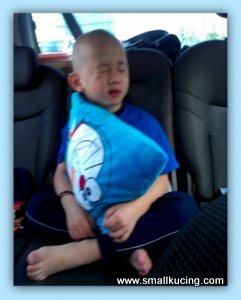 so good huh, hugging that huge doraemon pillow and sleep all the way from home to PD.. and reached PD already, straight away go and play with water and sand.. how nice!! When going for picnic, health freak Aunty Yannie wants fruits only. Tapau easier la. wanna cook so much chilingchalang. after cook then hv to wash up. 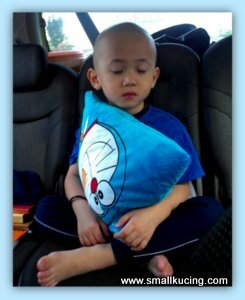 by the time start journey for picnic already exhausted lor. Hence recording it here now. That one is SIPUT lah! 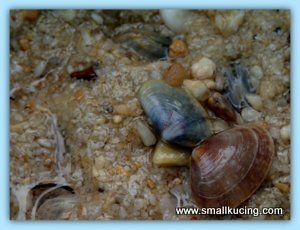 Korek 12 siput and the throw them into the wok to fry. That one is called "Fried Lala"...!!! Siput meh??? Tarak bring wok la. but the people camping nearby hv stove, wok and the satay grill. The PD sea water has changed so much. You have a choice of mud sea or red earth sea. Many people got rashes after swimming! Lucky no rashes ...only lots sand in da pant. I still hope to make a weekend stay there in PD and just relax in the room with seaview balcony. Nice! Sigh.....how nice...get a nice hotel. You mama so lazy to cook. She rather buy Nasi Lemak bungkus so that she could read more books!!! 7earky 8 early wanna cook ah? No thankiu lo. some more only 3person eating. 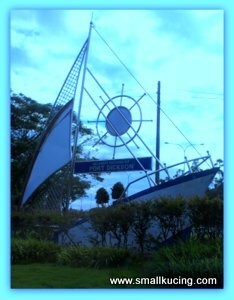 Have not been to PD for a long long time - used to have courses, meeting, seminars there...went so often. Cheap holiday on government's money... Hehehehehehe!!!! It is such a nice getaway on weekend for you and your parents. Brought along your new Doraemon pillow to beach, later get dirty ooo... Haven't been to PD yet cause no car when I studied in KL. By the way, did Mamarazzi cook the "lala"? The pillow left in the car. nah didn't cook the lala. put back.into the sea. You swimming alone in the sea? o.O"
Ya..papa n mamarazzi was watching. 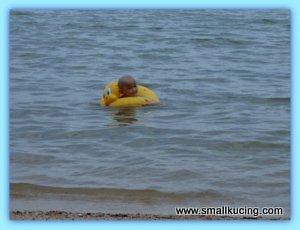 Small kucing is so brave to swim in the sea. I have not been to PD for a very long time now. About 10 years. Looks far but not that far la. but the water very deep. Lovely outing for your little one. As usual I been admiring his pictures and that little cheeky smile. Never been there before...nice place..
ooooo....so long ago> you dont like swimming? I have been there many moons ago..forgotten about how the place looks like already..